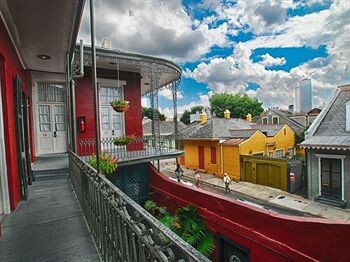 Property Location With a stay at Inn on St. Peter, you&apos;ll be centrally located in New Orleans, steps from Congo Square and Louis Armstrong Park. This romantic inn is within close proximity of Basin St. Station Visitor Information Cultural Center and Preservation Hall.Rooms Make yourself at home in one of the 29 individually decorated guestrooms, featuring MP3 docking stations and flat-screen televisions. Your room comes with a pillowtop bed. Complimentary wireless Internet access keeps you connected, and cable programming is available for your entertainment. Private bathrooms have complimentary toiletries and hair dryers.Rec, Spa, Premium Amenities Take in the views from a terrace and make use of amenities such as complimentary wireless Internet access and concierge services.Business, Other Amenities Featured amenities include a 24-hour front desk and coffee/tea in the lobby.